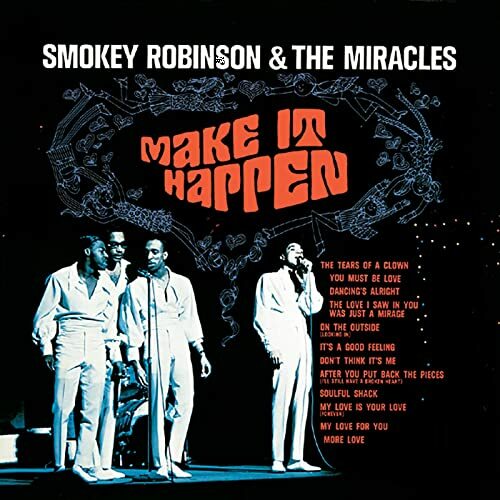 The most underrated Miracles LP of the ’60s, Make It Happen featured a spate of great songs, including three or four that really should’ve been hits (plus one that only became the group’s biggest hit three years after release). Opening with “The Soulful Shack,” a grooving dance number that would’ve fit perfectly on the previous year’s Away We a Go-Go, the album featured plenty of near-misses, including a pair of delightful good-times dance songs, “My Love Is Your Love (Forever)” and “It’s a Good Feeling,” plus a great choice for a cover, a tender version of Little Anthony & the Imperials’ “I’m on the Outside (Looking In).” The hits really did shine more than any of the other songs, though, marking yet another leap in the level of Smokey Robinson’s compositional sophistication. “The Love I Saw in You Was Just a Mirage” is a brilliant twist on a romantic novelty in the Motown mold (with a production that deftly references the British Invasion), while “More Love” is the most sincere lyric and most emotive performance in the group’s catalog, a song of reassurance occasioned by several miscarriages suffered by Robinson’s wife (and fellow Miracle), Claudette. The capstone, however, was the last song, “The Tears of a Clown,” originally written as an up-tempo instrumental groover by Stevie Wonder and his producer, Hank Cosby. Robinson’s lyric is witty yet sublime, and his lead vocal is one of the best performances of his recording career. One of the biggest misses by the notoriously hit-conscious Motown organization was failing to release this as a single before it became an album hit on British radio in 1970, three years after it first appeared. It shot to the top of the charts on both sides of the Atlantic, and prompted Motown to re-release Make It Happen under a new title, The Tears of a Clown.